In the already geeky world of kit geekery, I must confess to some uber-geekery. I’m a knife geek. But no ordinary knife geek. I’m a fungi knife geek. Its one thing being obsessed by the minute differentiations of waterproofs, boots, tents, water filtration systems or even can openers. But to be seriously into a piece of kit that at least 95% of people don’t even know exists is advanced dweebery. I do have mitigating circumstances however. 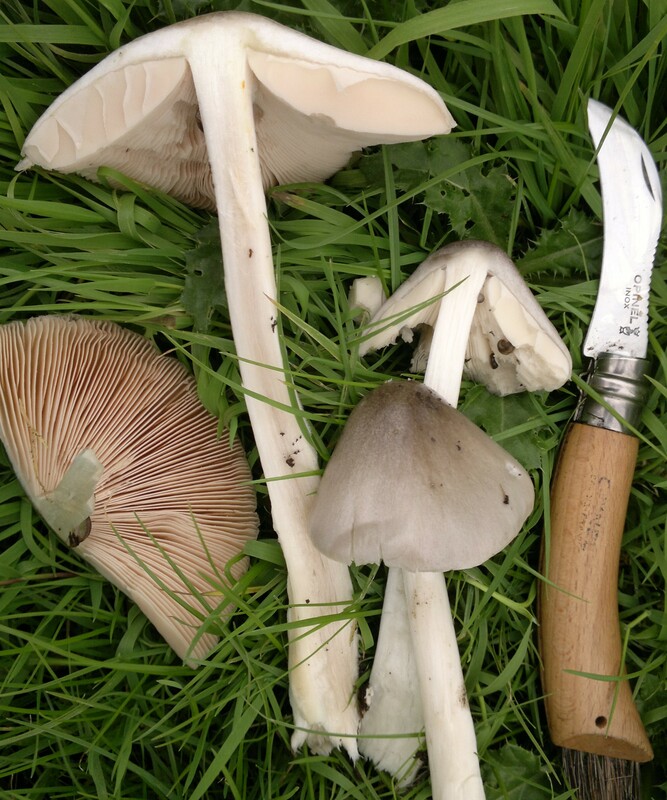 I have harvested, cleaned, chopped and eaten an insane variety of (mostly edible) wild fungi for the last 25 years and I now teach about foraging – and fungi foraging in particular – for a living. I’m not sure if this exonerates me or places me firmly atop the nerdy tree..? Anyway, I have, in my foraging journey to date, owned at least 20 different fungi knives. Some may find it an amusing irony that, as someone who finds things for a living, I have to date lost (at last count) 16 of those fungi knives. (I’m also trained to look for things in my spare time when volunteering with mountain rescue). I don’t find it amusing. Not at all. But at least it means I’m not a fungi knife collector. I’d like to be, but I’m too careless. I generally seem to misplace them as the action and euphoria of a bumper fungi find/harvesting session abates and I dawdle homeward through the forest struggling with sacks and baskets full of bounty. A wee rest here, and pop! the knife has gone. Vanished like a ghost at dawn. Occasionally I have foraged a previous season’s knife when revisiting a a favourite mushroom patch the following year. But mostly they just vanish. So I know a little about fungi knives. And I was delighted when I was kindly sent my 4th Opinel knife to review. Having lost three, I had banned myself from buying any more “high end” fungi knives. If you’ve read this far into a review of a knife you are fairly unlikely to need, I’m thinking you’re on the knife geek spectrum already and I won’t need to explain too much about Opinel. Basically, they make nice knives for all (mostly outdoor) occasions – some bushcrafty ones, but mostly the type that frenchmen reverentially cut their compté with while sitting beneath a chestnut tree waiting for a tourist to sneer at. I’m not sure if Opinel are at the top of the classy-outoorsman-knife tree in France, but they are certainly in the upper boughs of our slightly smaller UK tree. They make class fungi knives. 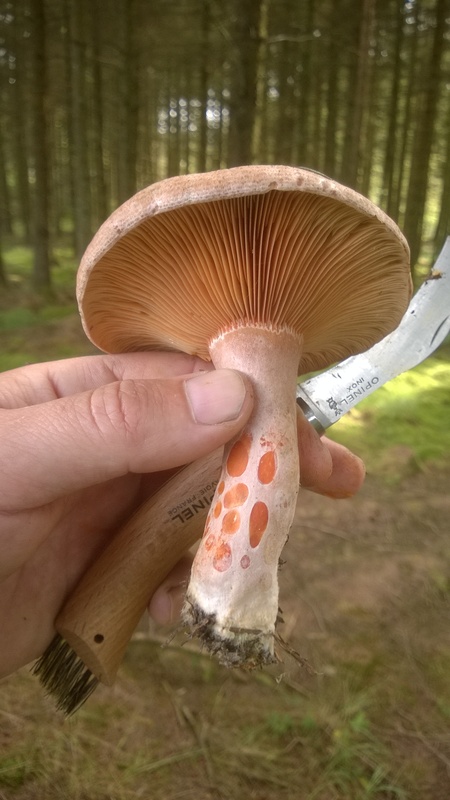 If you haven’t encountered one before, you are probably now quite keen to know what differentiates fungi knives from other less esoteric chibs. Mushrooms, after all, aren’t the most demanding things to cut – though they are composed of chitin, the same substance as crab shells are made from, though in a much softer form. This relationship with crustacea partly explains why fungi keep their form while lesser ingredients disintegrate into the stew. But why do we need a specialist knife for something that can easily be plucked from the ground, popped in a basket and taken home? Anyone who has mixed in mushroom circles (or should that be rings? ), may be aware of “The Great Pick/Cut Debate”. I have seen this disagreement run into venomous, shouty exchanges that would make the Scottish Independence debates seem like a mild difference of opinion over how best to eat a Tunnocks Teacake. 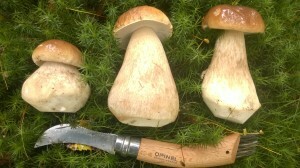 The “cut camp” argues that pulling the mushroom from the ground damages the fungal mycellium (the network of almost invisibly fine fibres that give life to the fungi). This, it is argued, is analogous with snapping a bough from an apple tree while picking apples. Seriously amateurish foraging. On the other hand, I have seen rabid followers of the pulling path claim that cutting the mushroom leaves the remaining stump to rot and “infect” the mycellium. This is clearly complete cobblers – fungi have evolved to rot away rapidly if left to their own devices. The truth is, as with so many over-argued points, the debate is rather more nuanced than the two camps recognise. Some fungi must be “uprooted” to reveal crucial anatomical features at the base of the stipe that could, very genuinely, be the difference between life and death. 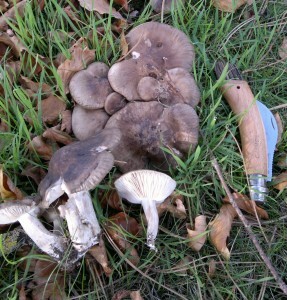 Other fungi are saprobic, their mycelium gathering nutrients from rotting material such as leaves. Pulling up these brings half the forest – and the delicate mycelium with it. They should be cut. The majority of choice edible fungi are mycorrhizal – living in complex symbiosis with plants and trees. Generally these detach with an almost pleasing “pop” from their mycelial bed, with no harm done. Research has shown that by far the greatest threat to fungal health is trampling and disturbance of the forest floor – so tread lightly. So the knife may, or may not, be used for cutting mushrooms from their mossy beds – but really, any old penknife would do for this anyway. 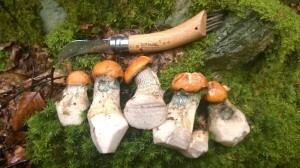 The lovely legnoart fungi knife (with chanterelles too small to pick). Three main things differentiate a fungi knife from a standard folding pocket knife: they have a forward curving blade, the blade has some fine, blunt serrations on the back, and, most crucially, it has a pert brush on its hind quarters. These features are all designed to save dirt and effort. 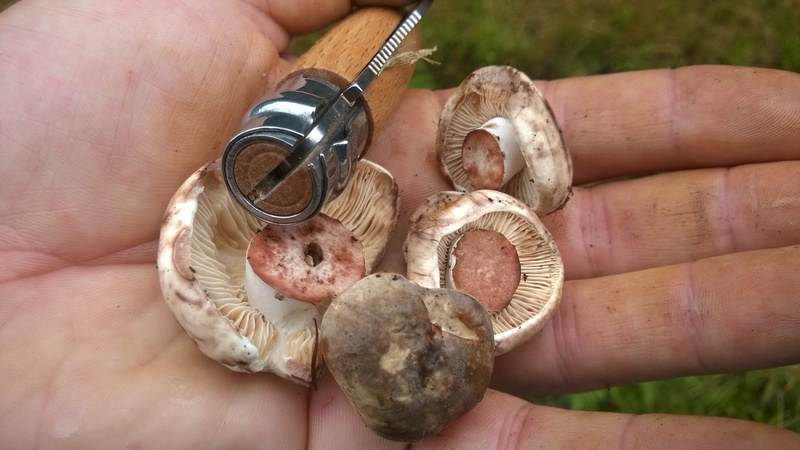 When you pick mushrooms, they inevitably come with some dirt attached to their base, perhaps some twists of moss, a small garnish of leaves and quite possibly some bugs that need evicting. If you don’t do this right away, and just pop them blithely into your basket, you are making a lot of extra work for yourself. The dirt and denizens will fall into the gills (or pores) and be much harder to remove at a later date. As in the kitchen, “clean as you go” is a motto of the experienced and skilled forager. The curved blade allows for sympathetic trimming of chubby stipes, allowing the besotted mycophile to sculpt and groom his hard-won quarry. The blunt serrations on the back of the blade can then be run, lovingly, down the stipe to chafe away unwanted detritus embedded in the upper stem (I seldom employ this function). Finally, the lovestruck forager will gently brush unwanted flotsam and interlopers from the nether crevices of their preciousssss, before taking it home, marrying it and stuffing a silk pillow with saffron for it to lie on. So now the uninitiated know the anatomy of a fungi knife, how does the Opinel compare to other fungi knives that you are never going to buy either? It’s a beauty. A proper classic. The wooden handle, which is hewn of beech, has a sensual curve that will make you want to hold it at all times, though maybe try to overcome this urge when picking the kids up from nursery. The blade has just the right amount of curve for trimming a plump cep in neat, continuous, utterly OCD curls. It has a ring-lock mechanism which I think makes it illegal to carry. 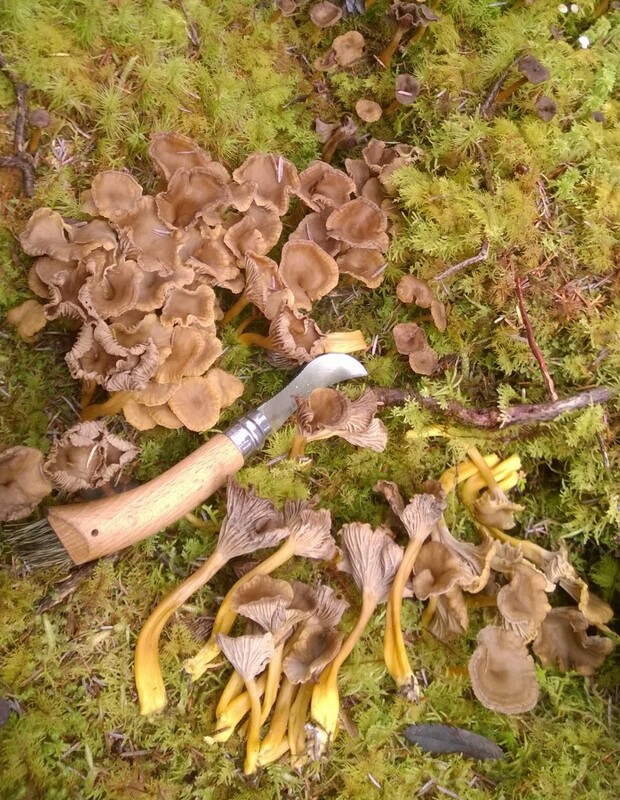 It really isn’t necessary – any fungi forager worth their salt gets into some precarious positions, and I recommend folding it away between branges. There is a small but important hole too, where careless foragers like me can attach a retractable string. The brush, which Opinel say is made of boar hair, has exactly the right stiffness for the job, and in a genius stroke of design brilliance is tapered, allowing for different types of brushing. You can ping things with the long end or stroke with the sides. You can damn near polish your mushrooms. Because they’re worth it. I’d say its worth having one of these knives even if you one of those people who thinks all wild mushrooms are poisonous and will never use in anger. I’ve used mine to brush pastry. I have only two minor points to raise about this knife. Firstly, its way sharper than a fungi knife needs to be. I cut myself in the first 3 minutes of proper use. But really, that’s a bad review of me and not the knifes fault. But I did work the blade down a little as most cutting in fungi picking is onto the thumb. Secondly, while giving it a serious work-out in a thunderously wet, yet gorgeously cep-filled day, the hinge started to tighten as the wood swelled, making it hard to open and close. This sorted itself out once the knife dried out, but was mildly irritating at the time. 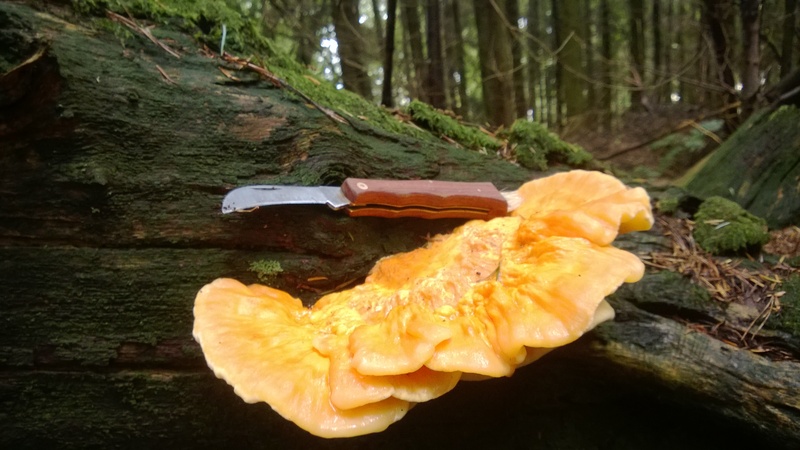 There are cheaper fungi knives out there, but not by much. Some have tweezers hidden in them – which you’ll never use. The standard Italian fungi knife, fond of it as I am (the little 4cm scale can be useful), is ugly and brutalist in its lines and you’ll never want to touch one after you have held an Opinel. For the fellow fungi knife geeks out there (surely the only ones to have made it this far), I can tell you that there is a knife out there that rivals the Opinel for beauty, but its four times the price. It made by Legnoart. Please send me one to review. I lost mine. 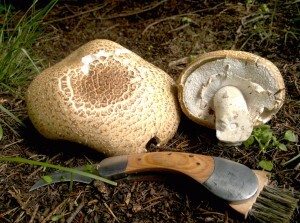 Do you offer morel foraging classes as well? Sorry, no. Morels are very scarce in Scotland! Can I just say, as a fellow owner of an Opinel, you are not alone in your love for this delightfully made product. Agree about the sharpness. Ouch! Lovely read, great to laugh at your wittiness, I have an opinel garden knife but not a funghi one, I shall look out for one. My funghi knife is a good Italian one.